DriversFood & beverage segment is projected to be the largest segment in the probiotics market during the forecast period. 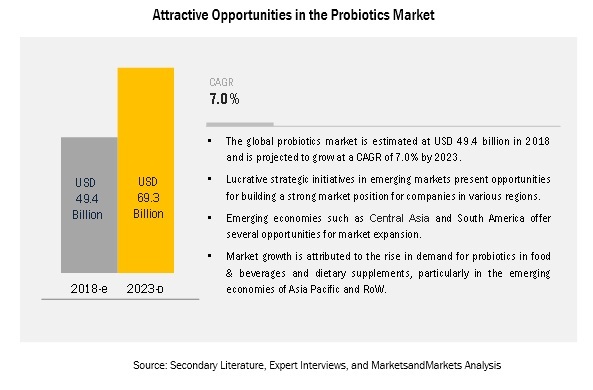 The food & beverage segment dominated the probiotics market, on the basis of application, during the forecast due to the rising popularity of probiotic functional foods & beverages among consumers. Awareness, faith in their efficacy, and safety are some of the factors driving the market of probiotics. The food & beverages segment is the largest revenue-earning market across regions. Consumers are now taking a proactive approach towards preventing chronic conditions. China and Japan are the two largest markets in the Asia Pacific, and the Japanese market is projected to reach its maturity level during the forecast period. The animal probiotics segment is projected to account for the fastest growth during the forecast period. The animals segment is projected to record the fastest growth during the forecast. The ban on synthetic antimicrobial growth promoters (AGP’s) in Europe is a factor driving the probiotics market. The motive behind the ban was to curb the practice of using antibiotics, antimicrobials, and other drugs for promoting the growth of livestock and increasing the production of meat, milk, and other products. The demand for liquid probiotics has increased as compared to dry probiotics, due to its application in yogurt, which is the most popular source of probiotics. Other products that use liquid probiotics include kefir water, probiotic juices, and yogurt-based drinks, which are healthy options for daily supplementation. The Asia Pacific region is projected to be a key market for yogurt in the coming years. China stands a huge opportunity for both domestic and international companies to penetrate the yogurt market as the country consumes yogurt on a large scale. The most widely consumed bacteria strains are Lactobacilli, Bifidobacteria and Streptococcus Thermophilusthermophilus, among others, which include Enterococcus, Bacillus, and Pediococcus. The primary benefit of incorporating scientifically-derived bacterial strains in probiotic foods is the balance in the host’s intestinal microbiota and the subsequent enhancement of the immune system. Lactobacilli are a genus within the lactic acid bacteria group, which have been proved to exhibit probiotic beneficial properties. Lactobacillus is used for skin disorders such as fever blisters, canker sores, eczema (allergic dermatitis), and acne. It is also used for high cholesterol, lactose intolerance, Lyme disease, hives, and to boost the immune system. Consumers in the Asia Pacific region are well aware of the health benefits of probiotics, due to the widespread presence of the Japanese brand “Yakult.” China and Japan are among the largest probiotic markets in the region, whereas the Australia & New Zealand market is the fastest-growing, with a CAGR of 13.3%. The Asia Pacific region presents immense opportunities for animal probiotic products, as governments are becoming increasingly concerned about the health and productivity of farm animals. Health deterioration in animals due to the use of AGPs has also encouraged livestock owners to use probiotic-based feed. The application of probiotics is estimated to increase at a fast pace in the Asia Pacific, due to the rising consumer demand. Key players identified in this market include Danone (France), Yakult Honsha (Japan), Nestlé (Switzerland), DowDuPont (US), and Chr. Hansen (Denmark). Key players in this market are focusing on increasing their presence through mergers & acquisitions and new product developments, specific to consumer tastes in these regions. These companies have a strong presence in Europe and the Asia Pacific. They also have manufacturing facilities along with strong distribution networks across these regions. In June 2018, Chr. Hansen expanded its product strain library for the development of next-generation probiotics. In August 2017, DuPont expanded its probiotic facility in Madison, Wisconsin, US. The company made an investment of USD 10 million. The motive behind the expansion was to further expand its presence in the probiotics market. In October 2017, Kerry acquired the US-based probiotics player Ganeden. The company entered into the probiotics business through this acquisition. In September 2016, Chr. Hansen acquired LGG, a probiotic strain used in food and dietary supplements, from Valio Ltd. (Finland). What are the new application areas that the probiotics companies are exploring? What kind of competitors and stakeholders such as probiotics companies, would be interested in this market? What will be their go to market strategy for this market, and which emerging market will be of significant interest? How are the current R&D activities and M&As in the probiotics market projected to create a disrupting environment in the coming years? 12.4.5.1 Spain is One of the Key Producers of Poultry Meat, Which Includes Broilers, Turkeys, and Ducks. 14.10 Morinaga Milk Industry Co., Ltd. The study involves four major activities to estimate the current market size for probiotics. Exhaustive secondary research was done to collect information on the market, peer market, and parent market. These findings, assumptions, and market size was validated with industry experts across value chain through primary research. Both, top-down and bottom-up approaches were employed to estimate the complete market size. Thereafter, the market breakdown and data triangulation were used to estimate the market size of segments and subsegments. In the secondary research process, various secondary sources such as Hoovers, Bloomberg BusinessWeek, and Dun & Bradstreet were referred to, in order to identify and collect information for this study. These secondary sources included annual reports, press releases & investor presentations of companies, white papers, certified publications, articles by recognized authors, gold standard & silver standard websites, food safety organizations, regulatory bodies, trade directories, and databases. After arriving at the overall market size-using the market size estimation processes as explained above—the market was split into several segments and subsegments. In order to complete the overall market engineering process and arrive at the exact statistics of each market segment and subsegment, the data triangulation and market breakdown procedures were employed. The data was triangulated by studying various factors and trends from both, the demand and supply sides, in the food and beverage industry. This research report categorizes the probiotics market based on ingredients, application, end-user, form, and region.